Keeping the most essential things accessible is a habit we all grow up with. You know well where you have that song which struck a chord, where you have the book that meant a lot, where you have the movie you like to return to. What you value; you find a place for it and remember where you kept it. Dr Rajat Chauhan’s book, ` The Pain Handbook – A Non-Surgical Way to Manage Back, Neck and Knee Pain,’ falls in this league. Its one for keeps. 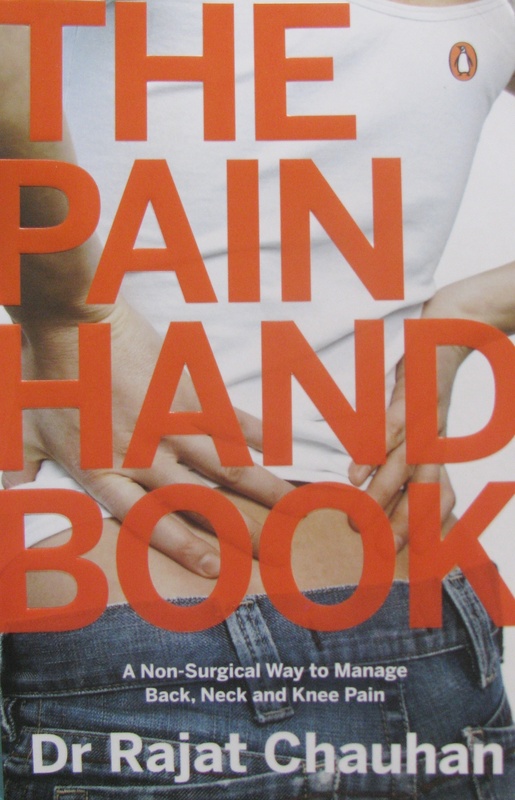 The book deals in the main with lower back pain, which is the most common pain reported. Doing so, it deals with the spine, knee, hip and foot besides touching upon other related points. Some problems are explained with case studies. The book’s biggest contribution, I felt, is how it helps you understand what is what in your back and lower body and what may be happening in your anatomy and lifestyle that is the cause of those aches and pains. It shows how the modern sedentary lifestyle is taking a toll on us; even how the health care system makes a business of the opportunity. The book encourages doctors to go beyond seeing their patient as mere statistic and attempt comprehension of person. After all, the cause of pain may range from injury to simply stress. Despite proliferation of advanced technology, some aches and pains can be addressed with the simplest of solutions. The book is written in a reader friendly style; almost conversational. The non-surgical way to managing pain is underscored by a portfolio of exercises and photos of the same, provided in the book. The narrative is partial to being a practical overview of pain (within that, lower back pain) and a useful handbook to refer. If you are looking for the science and phenomenon of pain or an exploration of its biological relevance, you may find the inquiry limited. Where it scores is in its larger appeal as guide (handbook) in times of predominantly sedentary existence with attempts made by the denizens of that world, to embrace a more active lifestyle. Besides being a doctor specialized in sports exercise medicine and osteopathy / musculoskeletal medicine, Dr Chauhan is a distance runner and the main architect of La Ultra-The High, a challenging ultramarathon at altitude held annually in Ladakh. This is a book I would like to remember where I have in the house. It is certainly worth buying, reading, keeping.